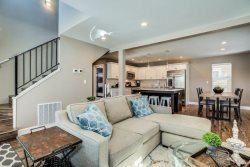 This perfectly proportioned 1-bedroom courtyard bungalow is located in the heart of the marina village & provides a unique blend of peacefulness & accessibility to all resort amenities right at your door. This delightfully detailed bungalow features a queen-sized bed, full bathroom, fully equipped & stocked kitchen, cozy dining area, living area with gas fireplace, and sleeper sofa . Outside you’ll find an entertaining deck with Adirondack chairs and picnic table to enjoy beautiful evenings in both summer and winter! Sleeps 4 people.